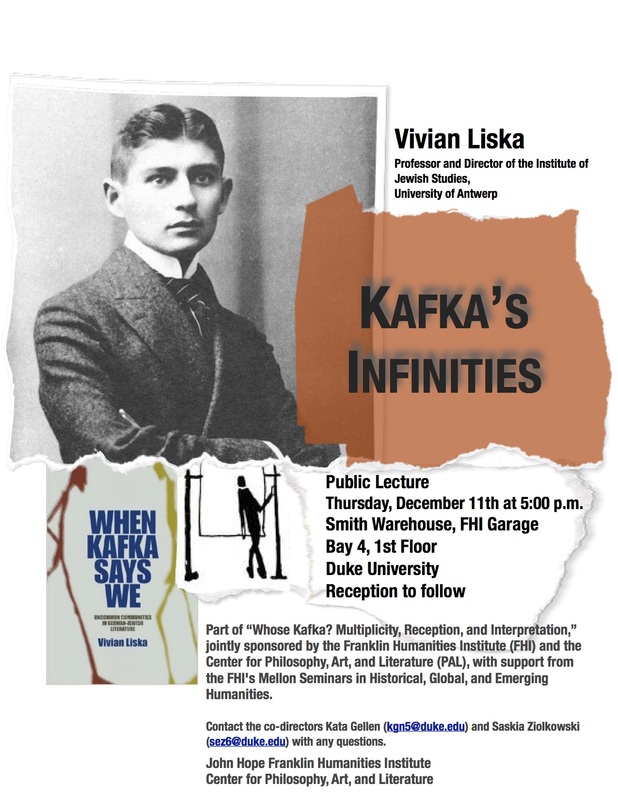 You are invited to attend the public lectures sponsored by the PAL/FHI Seminar “Whose Kafka?” Spring 2015. 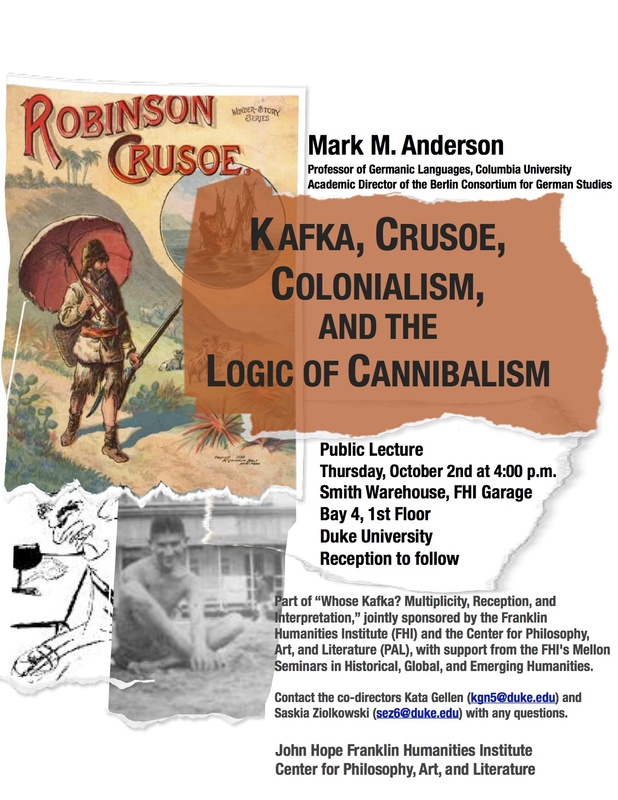 We would like to call your attention to some of the last events organized by the FHI/PAL Mellon Faculty Seminar “Whose Kafka,” happening March 20th and March 23rd. 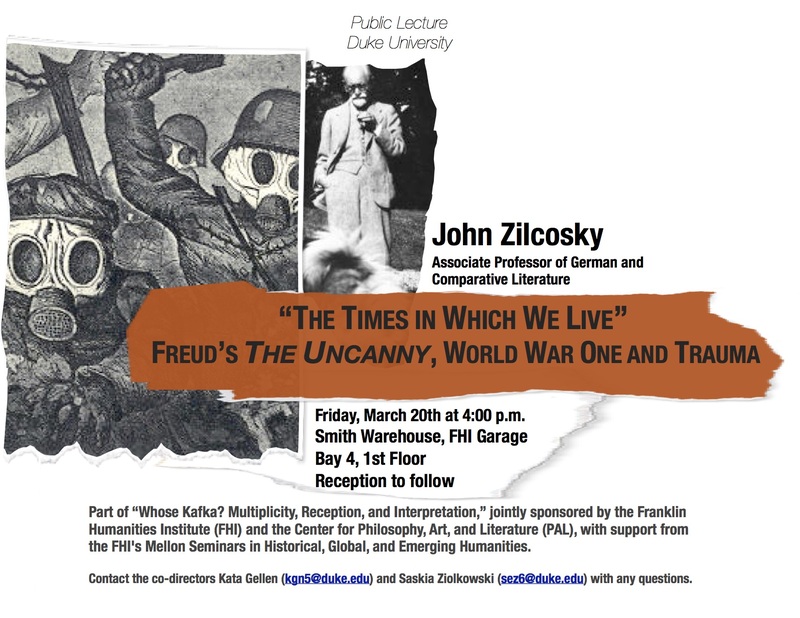 John Zilcosky (University of Toronto) will be giving a lecture, “‘The Times in Which We Live:’ Freud’s The Uncanny, World War One and Trauma” on Friday, March 20th at 4:00 in the FHI Garage. Reception to follow. John Zilcosky is Associate Professor of German and Comparative Literature at the University of Toronto. His monograph Kafka’s Travels: Exoticism, Colonialism, and the Traffic of Writing (Palgrave Macmillan, 2003) won the 2004 MLA Aldo and Jeanne Scaglione Prize. He was awarded a National Endowment of the Humanities fellowship for his project and forthcoming book, Uncanny Encounters: Literature, Psychoanalysis, and the End of Alterity, that relate to his talk. 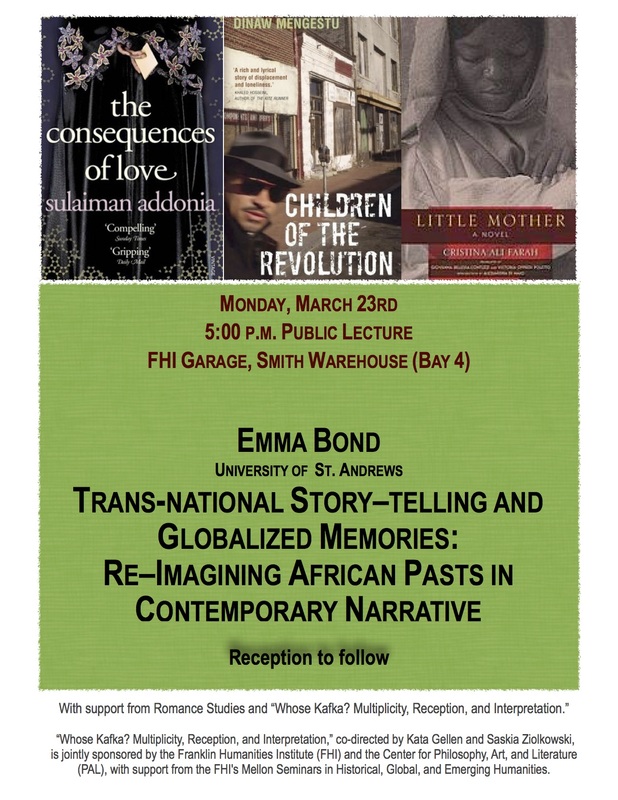 Emma Bond (St. Andrews) will be giving a lecture, “Trans-national Story–telling and Globalized Memories: Re–Imagining African Pasts in Contemporary Narrative” on Monday, March 23rd at 5:00 p.m. in the FHI Garage. Reception with heavy hors d’oeuvres to follow. Emma Bond is Lecturer of Italian and Comparative Literature at the University of St. Andrews and works on various aspects of the relationship between identity and space in modern and contemporary literature. She’s published the monograph Disrupted Narratives: Illness, Silence, and Identity in Svevo, Pressburger and Morandini (2012), co-edited Freud and Italian Culture (2009), and co-edited Il confine liquido: rapporti letterari e interculturali fra Italia e Albania (2013). She will speak on the trans-national dimensions and impact of globalization on memory, specifically in terms of Somali-Italian, Ethiopian-American, and Eritrean-Belgian authors and identity. FHI Garage, Smith Warehouse, Bay 4. We invite you to join us for one or both of the following Orson Welles and Kafka events on February 9th. 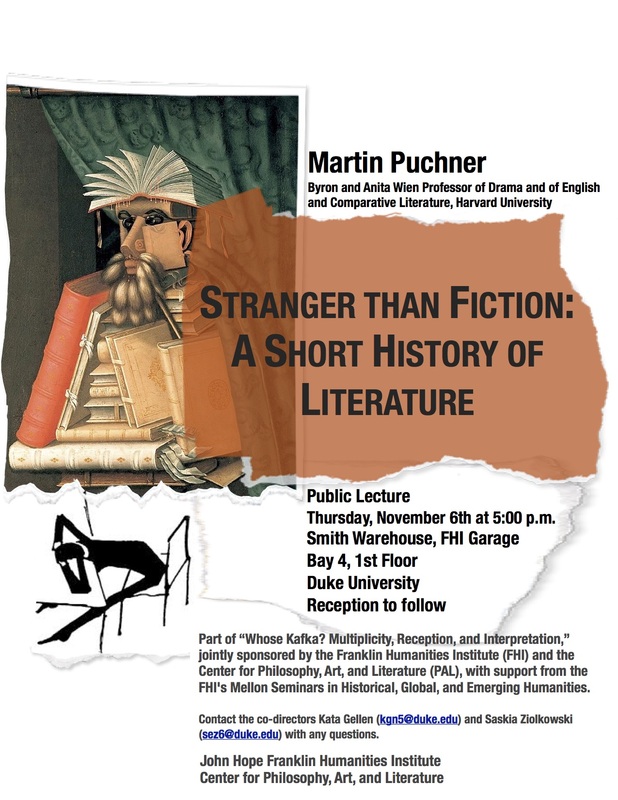 Davide Stimilli will present, “Slander and Blackmail: On Kafka and Welles” at 5:00 in the FHI Garage. The lecture will be followed by a reception and then a screening of The Trial, Orson Welles’s much-praised and controversial film adaptation of Kafka’s novel. Davide Stimilli (University of Colorado, Boulder) is Associate Professor of German and Comparative Literature and Humanities and has written extensively on Franz Kafka and Aby Warburg. Titles include The Face of Immortality: Physiognomy and Criticism (2005), Aby Warburg. La dialettica dell’immagine (2004), and Fisionomia di Kafka (2001). 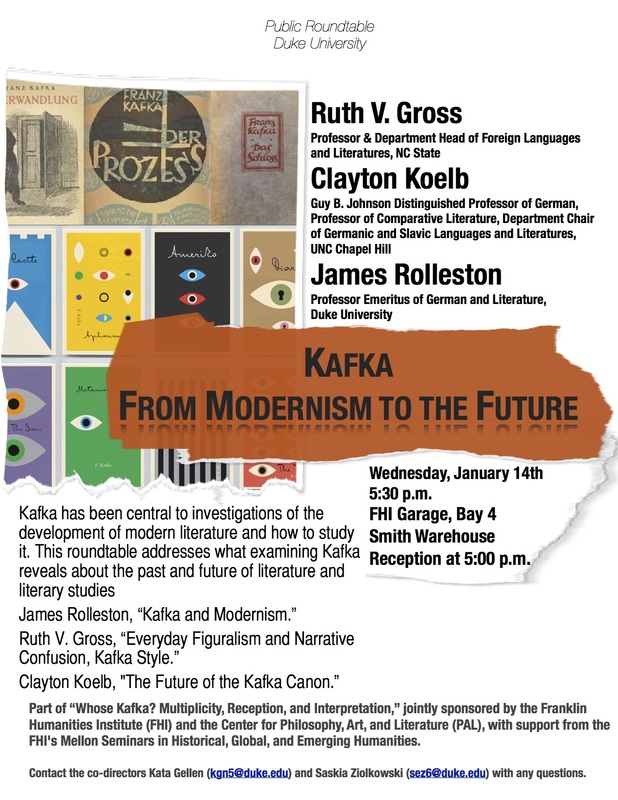 He will be presenting material related to his current book project on Kafka and Welles.